A new rumor surfaced that indicates Xiaomi is in plans to launch Xaiomi Mi Max 2 in May, that is exactly 1-year after the launch of its predecessor Xiaomi Mi MAX which happen to be in May 2016. Apart from the launch date, the rumor also gave details of some of the specifications of Xiaomi Mi Max 2. There are a couple of hardware changes expected to take place in Xiaomi Mi Max2. It will have the same 6.44-inch display similar to Mi Max. 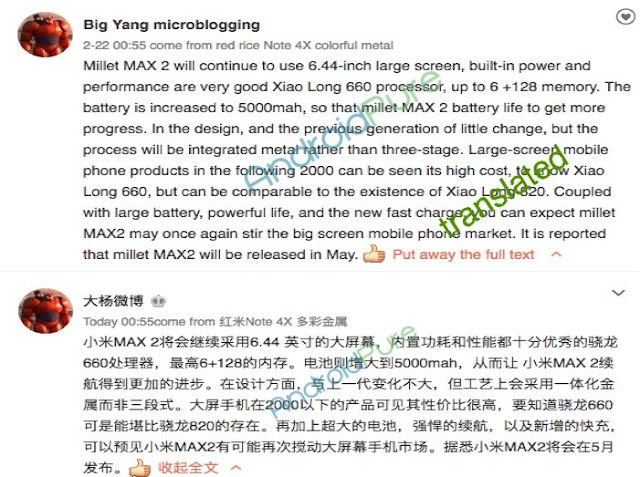 However, Mi Max 2 will have a slightly better battery of 5000 mAh compared to 4,850 mAh in Mi Max. There are no details about the camera sensors at the front and back and also the operating system. As we know Mi Max has a 16-megapixel rear-facing camera with PDAF (phase detection autofocus) and a secondary 5-megapixel camera in the front. As for the processor, Mi Max 2 will pack new Qualcomm Snapdragon 660 chipset which is an upgrade from Qualcomm Snapdragon 650 (Hexa-core) / 652 (Octa core) CPU in Mi Max.